While cooking, do you find yourself looking up the same questions over and over again? Questions like: How many tablespoons are in a cup? What’s the best beef seasoning? 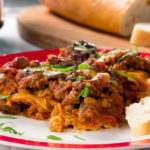 How do I cut this recipe in half? The worst part is, sometimes we’ll look up an answer and forget it 5 minutes later, “Wait, how many tablespoons was it?” It’s pretty frustrating, especially when you’re trying to get your meal cooked on time. So, we thought it’d be a great idea to make a few handy charts that’ll solve these problem forever! Here are 3 kitchen print-outs you absolutely need! 1. Measurements Equivalents: This chart is great for all those times when you don’t have the exact measuring tool you need, or it’s somehow “magically disappeared.” We’ve all been there! 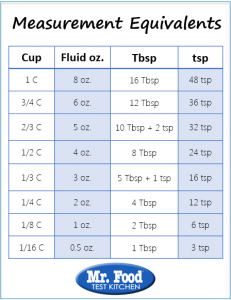 Instead of having to do an Internet search for measurement conversions, you can refer to this chart for questions like: How many tablespoons are in a cup? How many teaspoons are in a tablespoon? How do I convert a cup into fluid ounces? We recommend keeping this one in a kitchen drawer! Click to download image for printing! 2. How to Cut Down a Recipe: Do you ever find a recipe, but don’t have enough people to cook it for? Well then, just cut it down! It’s simple and stress-free with this easily accessible chart. Plus, it’s so much easier (and cheaper) to cut a recipe in half than spend extra time and money on wasted food. We’ve also found that cutting down recipes is a great way to test out new ones. This way you can see if you like the amount of seasoning, or if the cook-time is long enough before serving it to a large party. 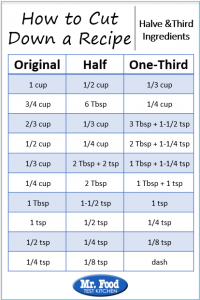 This printer-friendly chart will help you cut any recipe down to size. Note: If you want to make more of a recipe, multiple each ingredient amount by how much more you want. For example, if you want to make a recipe and a half then multiple everything by 1.5. 3. 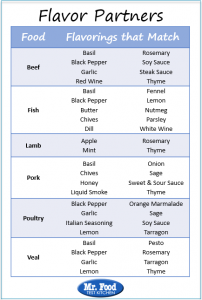 Flavor Partners: You’ll never wonder what to season your meat with again, because we’ve created a super useful chart to guide your flavor selection! From fish, to pork, to veal, we’ve got you covered with a list of tasty spices and marinades that will enhance the flavor of any meat. And don’t forget to get creative by mixing flavors together. Have some beef on hand? Try seasoning it with garlic and soy sauce. If fish is on the menu, try lemon, dill, and a little nutmeg. 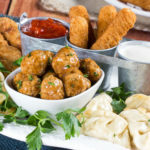 The possibilities are endless, and your gang will be excited by all the new flavors you bring to the table. Do you keep any other printed tips and tricks in your kitchen? i have a pad of paper on my fridge that i use to take notes on what works for me, how i’ve modified certain basic recipes that i use on a regular basis, and every so often i’ll take it down and condense it into a clearer, more readable format, and then put it up again. Thank you for these useful charts. They will come in very handy. I keep a spice chart and a list of snacks under-100-calories taped to the inside of an upper cabinet door. These are definitely going on another! Thanks. Somany times I`ve “googled” to find this kind of information. Thanks so much, It will be a big help!